An itchy scalp is often the first symptom of a head lice infestation. Pruritus results from a delayed hypersensitivity reaction after repeated exposures to louse saliva during feeding (see: “Head lice biology: know your enemy”).2 However, head lice infestation is not always accompanied by itch.3 The first time a person’s hair is infested with lice, the infestation is likely to be initially asymptomatic, with pruritus developing after approximately four to six weeks.1, 2 Pruritus is then likely to develop earlier during any subsequent infestations, and may persist even after successful treatment. Most people will initially notice eggs rather than live lice in the hair. The hairline behind the ears and at the nape of the neck are often the best sites for locating and identifying eggs.2 Lice can be more difficult to observe and children usually have less than 20 lice on the scalp at a time during an infestation.1 Detection combing is recommended to check for live lice. Treatment with a lice-killing product may not be necessary for people with eggs only in their hair, as these may be non-viable eggs or empty egg casings, possibly from a previous infestation.1, 2 Consider whether the person has had a previous infestation, whether they combed out eggs after treatment, and how far from the scalp the eggs are, i.e. over 1 cm, to help decide if these may be non-viable eggs or egg casings (see: “Head lice biology: know your enemy”). If live lice are found, check other members of the household. All members of the household should be checked and treated if live lice are identified. Lice lay their eggs close to the scalp as they require body heat to incubate, and usually hatch after eight to nine days.2 Eggs are approximately 1 mm in size, and are visible to the naked eye, although it can be difficult to distinguish viable eggs from empty egg casings. As the hair grows, eggs or egg casings will move progressively away from the scalp, and it is generally thought that eggs found further than 1 cm from the scalp are likely to be hatched or non-viable.4 Non-viable eggs or empty egg casings can remain attached to the hair for up to a year, if not successfully combed out. After hatching, young lice (nymphs) mature over 9–12 days to become adult lice, at which point they are able to reproduce. Adult head lice are approximately the size of a sesame seed. 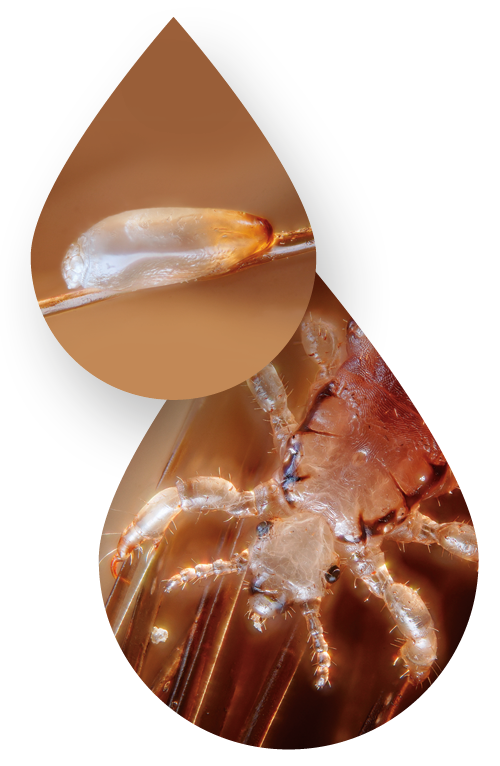 They feed by sucking blood from the scalp and are unlikely to survive beyond 48 hours if detached from a human host.2 Lice can appear grey to white in colour when unfed, or dark if filled with blood after feeding. What if treatment does not work? Cummings C, Finlay J, MacDonald N, et al. Head lice infestations: a clinical update. 2016. Available from: www.cps.ca/documents/position/head-lice (Accessed May, 2017). Mumcuoglu KY, Klaus S, Kafka D, et al. Clinical observations related to head lice infestation. J Am Acad Dermatol 1991;25:248–51. Centers for Disease Control and Prevention. Parasites - Lice - Head lice. 2013. Available from: www.cdc.gov/parasites/lice/head (Accessed May, 2017). Nair B, Cosmetic Ingredients Review Expert Panel. Final report on the safety assessment of stearoxy dimethicone, dimethicone, methicone… Int J Toxicol 2003;22 Suppl 2:11–35. Mumcuoglu KY, Barker SC, Burgess IE, et al. International guidelines for effective control of head louse infestations. J Drugs Dermatol 2007;6:409–14.